The U.S. government has ordered work stopped on more than a dozen wind farms, saying the giant turbines might interfere with military radar. 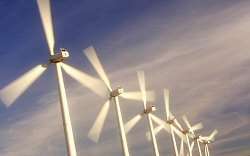 But supporters of wind power say the reason for the actions is political and has little to do with national security, the Chicago Tribune reported Wednesday. In one instance, critics say, a group of wealthy vacationers believe a proposed wind farm off the Cape Cod, Mass., coast would spoil the view of the ocean from their summer homes. The attempt to stop the planting of 130 turbines in Nantucket Sound has led to a moratorium on new wind farms across Illinois, Wisconsin, Minnesota, North Dakota and South Dakota, the Tribune reported. Federal officials have refused to say how many stop-work orders have been issued, but developers told the newspaper at least 15 projects have been shut down by the government so far this year. The list of halted wind power projects includes one near Bloomington, Ill., scheduled to begin this summer and start operations next year. That wind farm would be the nation's largest source of wind energy, generating enough power for 120,000 Chicago-area homes.